OEM REPLACEMENT COUPLINGS VULKAN KUPPLUNGS, GEISLINGER, CENTA, FLENDER - STROMAG, KTR, RENK, BHS, REICH etc. Above trademarks are only for reference. All trademark rights are belongs to the above companies. BHS- Centa - Flender - Geislinger - KTR - Reich - Renk - Stromag -Vulkan etc. Highly Flexible Couplings have been successful in the field of power transmission since the early 1970's. reinforced with fabric plies and steel laminations to produce flexibility and durability for optimum torque transmission. Torque range is from 22Kgm to 30,700Kgm. Spare reinforced rubber elements are 100% equivalent to that of our competitors in Germany. We have successfully replaced thousands of original installations worldwide. Our exhaustive reference list will adequately prove the reliability of our success. Reinforced rubber elements are manufactured in our own manufacturing plants with stringent quality control procedures in-place from the time of procuring of the raw material, through the time of manufacture and as the finished products get set for export. Low dynamic torsional stiffness resulting in low natural frequency of the drive system thus keeping the critical speeds below the operation speeds. Rupture is about 6 to 9 times the nominal torque. Our enormous reference list on Highly Flexible Couplings includes Marine Main Propulsion, Diesel Driven Generators, Pumps and compressors, arduous applications in Cement, Steel and Paper Plants, Oil Refineries, Locomotive Drives etc. The Couplings are also designed for arduous applications like cement & steel plants, Paper & Sugar mills, Textile & Chemical industries, Gensets, Locomotive Drives, Oil Refineries, etc. We guarantee 100% interchangeability and compatiblity with German manufacturers. The VF Tyre Coupling is torsionally soft flexible coupling, a feature that is most desirable for optimum torque transmission. Being flexible, it has inherent qualities of absorbing misalignments that occur in drive systems. The VF Tyre Coupling presents all the desirable features of an ideal flexible coupling including Taper Lock Bush (TLB) fittings. Flexible apart, the VF Tyre Coupling guarantees high stength due to the reinforcement of synthetic plies. This Coupling can be employed on applications where two coaxially rotating machines have to be flexibly connected. The hubs are available in either F or H Type Taper Lock Bush (TLB) fitting or bored to size (B Type). VF spare tyres are 100% compatible and equivalent with international standard. Therefore, we were invited to supply the requirement of several European manufacturers. VF spare tyres can also be manufactured with private label based on volume off-take. Flexible elastomeric coupling which is specially designed for blind assembly applications. 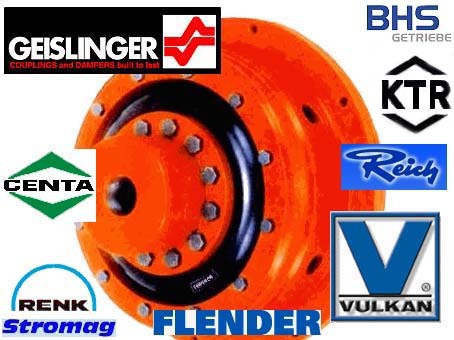 These are extensively used for Diesel Engine Drives, Conveyors, Compressors, Pumps, Agitators, Mixers, low or high speed Gear Boxes and many other Drive Units. Spare rings are 100% equivalent to that of our competitors in Germany. We have supplied our rings in large quantities to various European manufacturers. We can also manufacture and package for private label suppliers on a large a volume off-take. Provide damping of torsional vibration. Handles radial, axial and angular misalignments with care. Reduces noise and accommodates shock load.